GOD’S SPY is a fiery sensational thriller by Spanish author Juan Gomez-Jurado. It is set in the holy halls of Vatican City. And, before you even think it, let me state up front that this is NOT another takeoff on Dan Brown. The novels may both be set in Rome during the Pope’s death, but the stories are as different as --- oh, why not? – angels and demons. 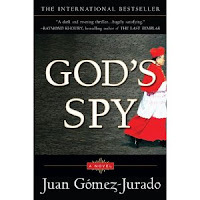 GOD’S SPY is packed with fast-paced action, realistic characters (some sadistically so!) and a shocking climax. I started reading and I could not put this book down. It’s a real page-turner. SUMMARY: Italian police profiler Paola Dicanti is on the hunt for a serial killer targeting cardinals at Vatican City following the Pope's death. Help comes in the mysterious persona of one Father Anthony Fowler, an American priest and ex-CIA agent. Anthony knows the killer – another priest! Father Victor Karosky is a pedophilic priest with a history of violence. He escaped from an American institution and now is on the loose in Rome and killing other priests. It is Paola’s job to get into Karosky’s head and find out why and how to stop him. It is Anthony’s job to protect the Church. As our two heroes race to stop a killer, they often find themselves at odds with the Vatican and Italian police and each other. 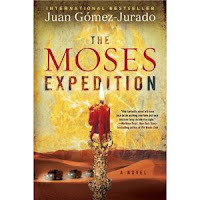 Look for Gomez-Jurado's next book THE MOSES EXPEDITION coming this summer. It promises to be another international sensation about the search for the Ark of the Covenant. Indiana Jones, move over!